Jean Nicole Rivers has a vision. With the clarity of an AMC Original Series, I began to see her book series, Black Water Tales simply by reading the description. My introduction to her art was no disappointment. On top of mounting her presence in literary horror; a third place runner-up at 2013's National Black Book Festival for Best New Author and many more, the successful aesthetics of her digital resume and interconnected themes in her work is an abyss of mystery in the shadows and light heralded by her brave protagonists. The Florida International University grad lives in Houston where Rivers reports that the horror scene, if it exists, is "not a large one." So she spends some of her down time "living for the release of the latest seasons of Netflix’s Black Mirror and Season 4 did not disappoint." Rivers' landmark creative work of fiction when she's not binging is a set about a small, midwest town known for both their extravagant holiday celebrations and supernatural lore that is fueled by the skeletons in just about every residents closet. "Black Water Tales is definitely a TV series in my mind," Rivers agrees. "The scariest thing about the stories that get the readers’ attention is the fact that these characters are not extraordinarily wicked, they are our neighbors, our parents and our friends and we find that the most prolific evils can be spawned and fueled by people who are not very different from us at all." 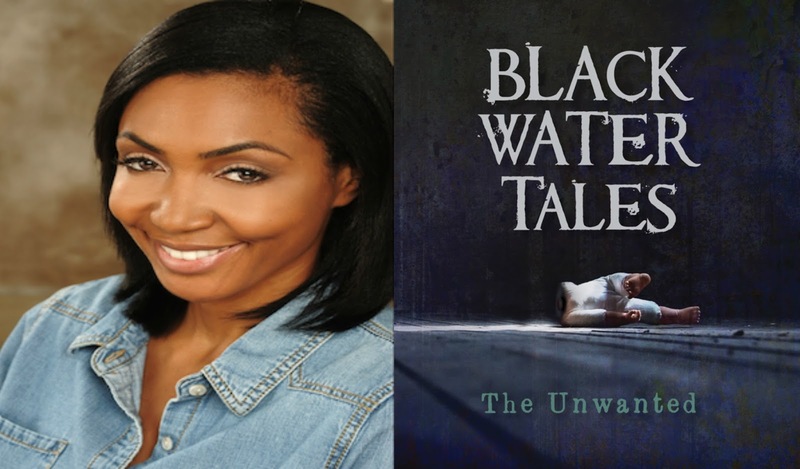 Plot and action are only as strong and compellingly layered as the characters created, and Black Water Tales pops because of its promise to resonate with everyone who decides to dive in. Book one, The Secret Keepers, is a mystery surrounding a cold murder case of a teenage girl whose body is found decades later and the now adult best friend of the slain, Regina is racing to unearth a truth that exposes Black Water in something described as "perverse". What 'I-don't-wanna-think-about-it' unthinkable things could be brewing? Rivers is unafraid to explore deeply sensitive subject matter in demonstration of horror's great possibilities. "I absolutely have an interest in taboo subjects and I have an even larger interest in stopping the relegation of important subjects into a realm of taboo and leaving them there because we’re afraid to talk about them." Horror is all about fear, regardless of whether or not that fear is reasonable. When I start to develop a new horror story, I think. “What scares me?” I mean, “What really horrifies me?” Is it the boogie man in the closet? Maybe and I may include him in my story, but he is still only symbolic. What does he represent? My fear that I am a bad mother? My inability to accept a mental illness? The boogie man is vital, but if he doesn’t mean anything to your audience, then you’re not inspiring real terror. While jump scare films can be entertaining and have their place, they are not horror, horror is an art form. Putting her words into action, Rivers is also a budding director. If I Die started as flash fiction and transformed into a horror short adaptation. Describing her first time in the director's chair, Rivers reflects fondly, "it was amazingly exciting to see my words on paper evolve into moving, colorful parts and characters. What inspired the story was the silver jewelry box in the film. That box was a gift to me from one of my sorority sisters (Sigma Gamma Rho). I’ve had it since college and once when I was fiddling with it, I realized that the bottom came up and that it would be a great place to hide a message and the short story grew from there." If I Die is carefully subtle in the subject matter it approaches. Rivers teases a clear conflict between characters yet leaves a provocative conclusion in step with its flash roots. In addition to publishing novels and directing, don't miss a chance on checking out her blog. The online journal triples as a peak into her short stories, horror film themes/recommendations, and fiction writer seminars, sparing no abundance of encouragement to other writers to trust their own vision. By sharing her story, Rivers has received motivation from the frankness of the high's and low's by creatives. "The most rewarding part of connecting with other authors in the genre is the inspiration that I receive from reading and watching their work. Pieces created by women in horror have an undeniable depth and perspective that only they can deliver and I am enjoying every moment of it." After consuming The Secret Keepers, be sure to check out Jean's latest book in the Black Water series, The Unwanted. A Black Water native, Blair travels to an eastern European country to volunteer at an orphanage. Its poor conditions reveals an otherworldy, sinister force wreaking havoc that may be connected to Blair's own traumatic loss.